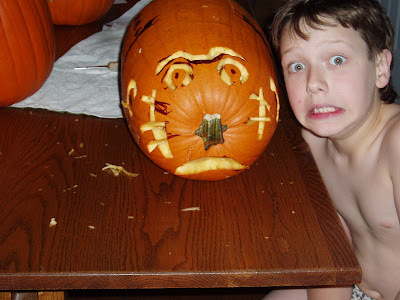 We have so much fun carving pumpkins every fall. This year, one of Terry's friends gave us 4 really nice pumpkins (for free) so we skipped the pumpkin patch excursion. It would have been fun to go pick out pumpkins, take a hay ride, get pictures picking out pumpkins...oh well. We will try that route next year. Can't really beat the free price of these pumpkins, either! We decided to carve pumpkins on Wednesday night, and it was fun! We even saved the seeds, and Terry made an amazing batch of seasoned baked pumpkin seeds. We looked up a few patterns for carvings online. Madelyn didn't really like the pictures of the pumpkins we saw. I am not sure why they somewhat freaked her out, but they did. There are some really creative people out there with their ideas! Speaking of creative, Nathaniel was really creative this year! He made a Rhinoceros! 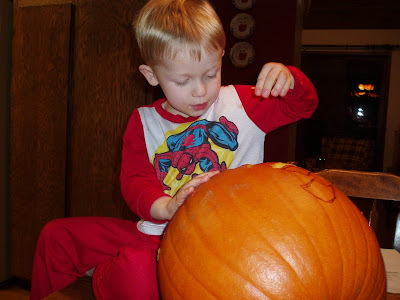 He laid his pumpkin down, had the stem as the nose, and had me carve out the rest of him! What a great face! Sorry he is in his boxers. He just got out of the shower, and he wanted a picture with his finished Rhino! 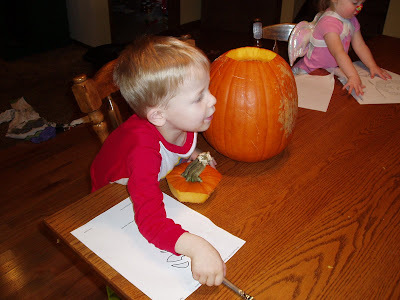 Caleb had a great time picking out his "dog" pattern for his pumpkin. It turned out pretty cute! 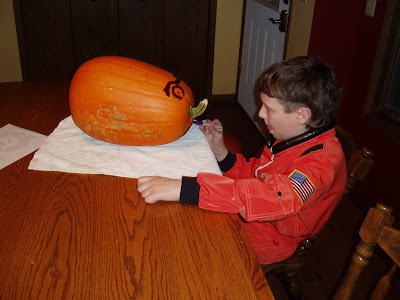 I will have to get a picture of the finished pumpkin. I must have missed getting the full picture of that one. 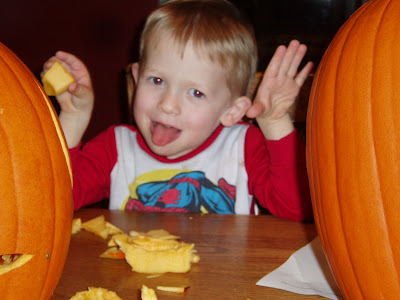 Caleb enjoyed playing with the carved out pieces of pumpkin. 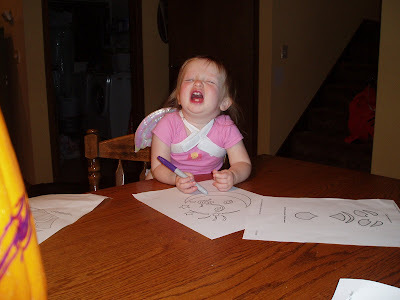 Every kid needs to make a silly face while holding something close to their face, when they are young. Did you do this, too? I know I did! Madelyn is really into making funny faces while she is smiling. She is so cheesy sometimes! She just cracks me up! 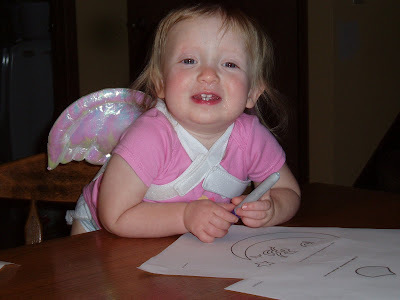 We put on her "angel wings" from last year. I actually bought an angel costume for Lena (our dog) last year, she didn't like it, so Madelyn wore it. Really dog costumes fit small kiddos really well! She is such a little goofy sweetie! She is a comic, and she knows it! I love her little cheeks! So kissable! She didn't make any pictures on the pumpkins. Terry and I didn't carve our pumpkins yet...and I don't think we will get to it until next week sometime. It was a lot of fun, but I wish we would have had more time to do it...like a Saturday afternoon. We were a little rushed that night. But, it was fun nonetheless. I think the kids had a great time, too! If any of you are going out and about tomorrow night, be safe~ I think we will do some treating at family/friend homes, a few in a neighborhood, and then (hopefully) heading to a friend's house for a movie/gab night. Lullaby Exercises DVD: A Review & Two Giveaways! I am really looking forward to the birth of our fourth baby (due in January). I was excited to get the opportunity to review the new DVD from Chicks-n-chickens because this will be a great DVD for me and my new baby to do together! I have put on a few pounds~ OK a lot of few pounds... and this DVD will motivate me to get back into my pre-pregnancy jeans. Lullaby Exercises offers a new kind of workout for moms who want to take better care of themselves and their babes. The 35-minute DVD features a series of fun and easy-to-learn movements that give moms what they and their babies need most: toning, soothing, bonding, and sleep!! While doing the Lullaby Exercises, moms can wear a sling or hold their baby in their arms as they squat, shuffle and leg-lift through the high-energy Groove set and then slow it down as the Sleep set sends the little one into slumberland. Moms also feel the relaxation, and can take a nap with baby! Lullaby Exercises includes an audio CD of the original soundtrack by singer/songwriter Lisa Phenix so the sets can be done in front of the TV or on the go. Chicks-n-chickens and Lullaby Exercises originated from Darcy's desire to get back in shape after the birth of Reed, her first born. "With no time for the gym and a restless baby at hand, I started dancing around the house to get him to sleep...and the idea for Lullaby Exercises was hatched," says Darcy. Chicks-n-chickens was written up on Daily Candy, and you can read what they wrote. I am really excited to implement this DVD into my daily routine when baby arrives. What better way to calm our baby down than with music, movement and babywearing? Plus, it is a great incentive knowing those pounds will shed off. Recommended baby age 8 weeks to one year. Lullaby Exercises can be purchase here for $29.95! You can enter to win this great DVD by going to the Chicks-n-chickens website and telling me what else they have to offer for purchase, or something you liked from their site! (click on shop) This contest is open to all readers living in the Continental United States. Click here to see how you can earn extra credits to win, and click here to see guidelines and the official rules. Contest will end on November 10th, at 7:00 PM CST. GOOD LUCK~ There will be two winners!! The Sporty's DVD review and Giveaway! My Son, Caleb, is a big time sports nut! He has always had the love of sports involving balls...football, basketball, soccer, and baseball. I was very excited to review the new DVD called The Sportys. It is the first DVD in the series featuring the basics and fundamentals of sports. 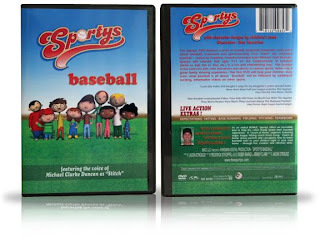 This DVD features a team of lovable animated characters being taught about baseball, teamwork and sportsmanship. The voice behind the characters is of Academy Award nominated actor Michael Clark Duncan as “Stitch” the ball. The series connects kids (ages 3-11) with the characters and stories so they will have a great time watching and will truly learn what baseball is all about. This first DVD will be followed by additional exciting and informative videos for other sports. Caleb had a great time watching this entertaining video. He is excited to see the other sports coming up. The Sportys series was developed by Bobby Barad, a sports attorney and his longtime client and friend Brady Clark, a major league baseball player. Both Bobby and Brady are young fathers who were amazed at how easily kids learned when they didn’t realize they were learning. The Sportys will allow kids to learn about sports almost by accident as they will enjoy the characters, songs and stories. The Sportys retails for $19.99 and can be purchased here. You can enter for a chance to win your own copy of The Sportys by leaving a comment about which sport is your favorite, or your child's favorite! This contest is open to all readers living in the Continental United States. Click here to see how you can earn extra credits to win, and click here to see guidelines and the official rules. Contest will end on November 6th, at 7:00 PM CST. GOOD LUCK~This contest is apart of the great Bloggy Giveaways going on! Click here to check it out!! Friday, my uncle passed away. He was age 77 (so young yet) and passed away from an infection. He had been diagnosed with Lung Cancer a few months back. He got pneumonia, and he was treated for his emphysema. He did have some big health issues, so it was (to some point) a relief for his pain. My Dad has 7 sisters, and this is the third brother-in-law to pass away. It was sad, because he was one of my favorite uncles. On Sunday, my cousin (his daughter) called me to ask if I would be willing to sing a duet for the funeral. I was honored to be asked. My other cousin and I sang 2 songs for the funeral. Monday night was the viewing/wake, and on Tuesday morning was the funeral. So, Monday afternoon, my cousin and I got together with the pianist to practice the songs. I think I had heard the songs from my childhood, but I had to re-learn them. They weren't the "traditional" funeral songs, but they were some Country Gospel songs that were dear to my aunt and uncle. The practice went well. On Tuesday morning, we were there earlier for practice. My brother was asked to play his harmonica for the funeral, too. He is an amazing harmonica player! Anyway, my parents arrived and they were walking into the church. While walking, my mom's foot caught on the sidewalk where the cement didn't match up. She fell straight down ~head first~ onto the cement. She didn't have time to really catch herself. I didn't see it, but later she told me that her nose was instantly running blood. She didn't have any vision in her left eye for awhile, and through the funeral her eye sight was all disoriented. I had to get ready to sing, so I didn't see her after the fall. I missed seeing her after the funeral because I went to the burial. Then, she was gone when we returned! I was so worried about her! The burial was so very sad, and such a tribute! My uncle was in the military, so he was given the 21 gun salute. WOW~that is something amazing! Then, 2 guards folded the flag and did some saluting. Then, one of them walked over to my aunt, handed her the folded flag, and gave her an honored salute! I lost it...with my tears. After that, the funeral worker took out single roses out of the bouquet and gave them to my aunt and her children. My aunt then walked toward the casket, touched it lovingly, and said some words through tears. It was so touching, heart-wrenching, and sad. I cried hard as we walked back to our vehicles. Terry and I just held each other. Funerals are never easy. Later that evening, my mom called and gave me the updates. She has 2 broken areas in the left side of her left hand....from falling on her hand. She also has a crushed eye socket~OUCH! She will have to have surgery. Her hand was so swollen that they have to wait a few days to set that and put on a cast. Poor Mom!! I feel so bad for her! I am thankful it wasn't much worse! She will also have to replace her glasses, because one lens is totally scratched up, and the frames were bent. So, that is why I have been a bit distant on the personal side with my news. I will try to write more tomorrow. I am just exhausted tonight. I will be visiting some of you tomorrow, too! I promise! Good Night! Bella Sara is a trading card game, very similar to Pokemon cards. Bella Sara is a card game geared toward girls ages 5 to 12. The cards have pictures of horses on them. 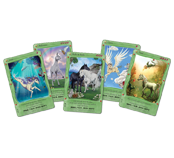 Girls can access the magical online land at Land of the North of North where the horses live (from the Bella Sara trading cards). Girls can feed, care for, train, and play with their horses and also play games and solve puzzles on the site. 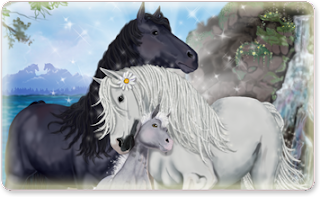 Bella Sara will be introducing the new baby Bella foals coming soon! On November 6th, the website is kicking off a 10-day celebration where kids can qualify to win ~daily~ prizes, print of babies' birth certificates, read stories, get access to special codes and more. Team Mom sent me 2 packs of sample cards of Baby Bella cards to preview. The cards have special access codes to use in the land of the North of North. Once those codes are entered, the horses are put in your stable. Then, you can earn horseshoes to trade in for things to decorate your stable. I think this is a fun outlet for girls to explore, but I am not into the magical/mystical products much. I know that so many boys are really into Pokemon trading cards, so I think this is a fun way for girls to get in on the trading/playing cards, too. Target is offering a 10% discount right now for Baby Bella Blister packs, 2 packs, value collections or holiday tins. Click here to find out where you can find Baby Bella cards near you. I am a hand-washing freak...at least I have been told. I also like to make sure my kids practice good hand washing techniques. I know that so many germs and bacterias like to lurk on our hands, and we use them so much~ especially to put things in our mouths. I like to think that with good hand washing, many sicknesses and diseases can be avoided. MRSA (methicillin-resistant Staphylococcus aureus) is a type of Staph bacteria found on the skin and in the nose that is resistant to antibiotics. More than 90,000 Americans get potentially deadly MRSA infections every year and in 2005, nearly 19,000 Americans died from MRSA infections. More deaths are linked to MRSA infections than AIDS. There are two known types of MRSA. You may have heard of Health care-Associated (HA-MRSA), which occurs in hospitals and nursing homes, but a newer type of MRSA is Community-Associated (CA-MRSA), which has recently begun to spread in public settings like gyms, locker rooms, households and schools. People can carry MRSA and not have any symptoms. These "carriers" can also transmit the bacteria to other people. can be easily spread through skin-to-skin contact and by touching contaminated items. This is why it is crucial to take measures to help reduce the spread of MRSA using these practical steps. Scrub up - Wash your hands frequently with soap and warm water for at least 15 seconds - the time it takes to sing Happy Birthday twice - or use an alcohol-based hand rub sanitizer. Cover your cuts - Keep any nicks or wounds covered with a clean, dry bandage until healed. Keep to yourself - Do not share personal items, like towels or razors, that come into contact with bare skin. Use a barrier - Keep a towel or clothing between skin and shared equipment. MRSA, like other staph bacteria, can cause a skin infection such as pimples, rashes, abscesses, boils or what can look like a spider bite. These infections are usually warm, painful, red or swollen. Those are symptoms to really watch for and to let you Doctor know about. Reading about this disease makes me even more firm about hand washing, and making sure my kids wash up well! Help spread the word about this bacteria, and the MRSA Website to help prevent it! You can Help Stop MRSA by joining the coalition...and it is free! Little Jet Set: Review and Giveaway! Traveling with children can be a challenge sometimes...especially when they get bored...or tired...or just plain restless. I really like the Little Jet Set website, because it has so many great products for those very occasions when you are traveling with your little ones! LittleJetSet.com offers many great products that will be a big hit with kids, like books, games, arts, crafts, toys and more. One of my favorite travel items is the Zoobie Pet! We recently got a Baby Zoobie from Little Jet Set, and this one is the perfect size for sweet Madelyn! It is a little smaller than the original Zoobie Pets. The Zoobie Pets are a 3-in-1 pet for kids. They are a stuffed animal, a pillow, and when you open up the zipper, they are a blanket! How handy is that? They have a toy to make-believe with, and then when they get tired...they have a pillow and a blanket! 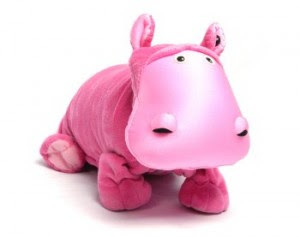 I can see Baby Hada (the pink Hippo) will be going on all our family trips! Her soft, fleece blanket has a special "comfort corner" on the blanket for extra comfort. I like that I can store little Hada in the diaper bag, too. Little Jet Set also has Ellema the Elephant, Kojo the Croc and Tama the Tortoise available. Retail price is $25.95. Little Jet Set was co-founded by a pair of seasoned attorneys turned expert “mom travelers” who decided to take a sabbatical from practicing law to share their knowledge about the inherent challenges of traveling with children with other parents. well-constructed products to share online at www.littlejetset.com that appeal to various ages and interests and that respond to the travel needs of today’s families. Would you like to win a Baby Zoobie from Little Jet Set? This contest is apart of the great Bloggy Giveaways going on! Click here to check it out!! Madelyn is fighting some kind of nasty. She started feeling ill last night when we had the grandparents over for a supper celebration for Nathaniel's birthday. She did fine, until the end of the night. She was feeling a little warm...OK, maybe it was a lot warm. So we gave her Tylenol and she went to bed. She woke up around 10:30, and Terry brought her downstairs. He said she was on and off with sleep, but she was mostly awake. At 1:30 AM, Terry crawled into bed with her after giving her more Tylenol. She was wide awake, kissing and hugging me. He said that he was playing his game on the computer with his Dad. Most of the time when Terry plays his computer game (Age of Empires) it puts Madelyn to sleep~ understandably :). Not last night, though. She was sitting on his lap saying, "horse!" and other words. I don't understand that. So, anyway, she is in bed with us...super hot. After the meds were in her system for 45 minutes, she was still hot. I put her in lighter jammies, and waited out her restlessness. Somewhere around 3:30 she ended up falling asleep and I was dozing soon thereafter. She has been very cuddly and just not herself today. She can keep her mood happy for the most part...which is super! At one point today, her temp got to 102.2 under the arm. So, being it was under the arm, it was a little higher than that. Poor little hunny! I hope she sleeps better tonight. Speaking of which...I should get to bed. More updates tomorrow! I have lots to catch up on! It is that time of year again where the Bloggy Giveaways are going on! This is a great, big BLOG carnival full of participants with contests going on! Thank you for visiting my blog! I hope you feel welcome...and would like to visit again! My name is Sarah and I am a PT working out of home mom. I babysit another child in her home, along with my kids...so I consider that a SAHM still. I have 3 kiddos.. a boy who is 10 years old, a boy that is 3 1/2 years old, and a 19 month old girl. We have a baby due the beginning of January 2009. So, we are busy in the Sassyfrazz home. Without further ad0...I would like to introduce to you my first contest offered in the Bloggy giveaways. See Kai Run makes amazing shoes for our little ones! I am a huge fan of their quality made shoes!! The shoes are made with leather and are extremely flexible! See Kai Run's footwear meets the American Podiatric Medical Association's rigorous standards for foot health and functionality and has been awarded the APMA's prestigious Seal of Acceptance. They have a great selection of hip and urban shoe designs available! One of my favorites are the Peggy boots that I have for my daughter! I think they are so cute on her feet, and she walks so comfortably and with style! These shoes are warm on her little feet, and breathable, too! 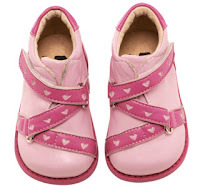 The velcro keeps the shoe on her foot, and it is easy to put them on and off. The Peggy Boots are made with sheepskin leather, the sole is super flexible and the toe is wide for plenty of room to grow and move. These shoes are great for indoor and out. Madelyn loves shoes and she gives them 2 thumbs up~ so do I! 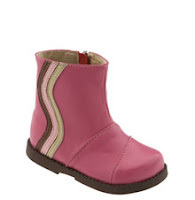 See Kai Run makes another great boot for girls called the Julie boot in pink (limited edition). The See Kai Run site shows this boot in the new fall colors (with brown), but I have a picture of the pink. I think it is an adorable boot. The Julie boot is made with the same super-soft sheepskin leather. I think that is my favorite feature of the See Kai Run shoes, and the flexibility! I wish these shoes came in adult sizes! The Julie boot can be purchased with the breathable leather lining or cozy faux-fur lining. The zipper is on the inner side of the foot, which I think helps keep the zipper protected. See Kai Run also makes great looking (and quality made) boy shoes! I got the Paul in blue (limited edition) shoes to check out! I can say they are one of the cutest shoes I have ever seen! These adorable shoes are made with the great sheepskin leather, are extremely flexible...and can I just say any little boy would be totally styling in these? The shoes look like dressy tennis (but the laces don't come out) and there is a velcro strap to keep the shoes on! I really like the colors, too! You should check out the See Kai Run site and look at all their amazing choices for shoes! You will be impressed with the selection, and once you purchase~you will be impressed with the quality you receive! See Kai Run was created and inspired by none other than Kai's Mom! She knew the need for comfortable shoes with flexible soles for her son, Kai to wear outdoors. She wanted to create a line of shoes that was as happening as Kai - bold, hip, fun, with an urban sensibility. Something entirely different than what was offered. She came out with great shoes for both girls and boys...and I highly recommend them! Into this overwhelmingly complex political situation, Dr. Kennedy and Jerry Newcombe bring a clear, compelling, and nonpartisan exploration of what God’s Word has to say on these critical matters. How Would Jesus Vote? isn’t intended to tell readers which candidates to support; rather it offers a Christ-centered understanding of the world to help readers draw their own political conclusions. Author Bio: Dr. D. James Kennedy is one of the most trusted and recognized Christian leaders of our time. The senior minister of Coral Ridge Presbyterian Church in Fort Lauderdale, Florida, he is the featured preacher on television’s “The Coral Ridge Hour” and radio’s “Truths That Transform”, syndicated on over one thousand stations throughout the U.S. The founder and president of Evangelism Explosion International and chancellor of Knox Theological Seminary, he is the author of more than sixty books, including the bestselling What If Jesus Had Never Been Born? Jerry Newcombe is senior producer for Coral Ridge Ministries television and has produced or co produced more than fifty documentaries. The host of two weekly radio shows, he has also been a guest on numerous television and radio talk shows. He is the author or coauthor of more than fifteen books. 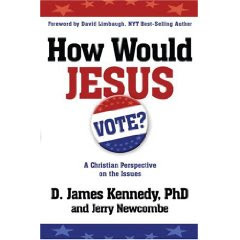 You can order How Would Jesus Vote? from Amazon right now for $11.55 on sale from $16.99. K'NEX SawBlade Thrill Ride = building fun! 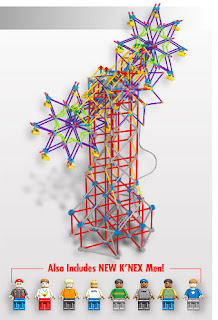 K'NEX building sets offer hours and hours of building fun! I really think it is a super product to spark the creativity and imagination in those building! This is such a great product for our kids, especially since our world thrives off of media entertainment. Not that media is bad, but it is good to have a product where kids can use their skills and be challenged! 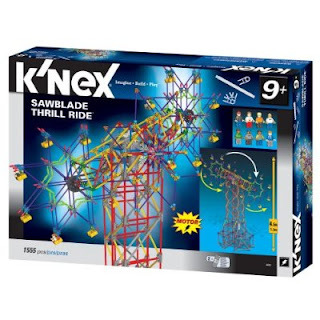 The K'NEX SawBlade Thrill Ride set presents a big challenge with 1,555 colorful K'NEX pieces, motorized, dual-spinning wheels and 8 K'NEXmen riders! Kids will get a great since of accomplishment once they finish building the Saw Blade Thrill ride measuring over 4 feet tall! The builder of this great amusement park ride will need to follow the color-coded instructions to build this step-by-step. The motor will be switched to on and the ride will burst to life. Two star-shaped wheels begin to quickly spin as the central arm rotates round-and-round to create a high octane twist on a traditional Ferris Wheel experience. I like that there is an option to build a second model with this kit. The directions can be found on the K'NEX website. Saw Blade is appropriate for ages 9 & up and requires 2 "AA" batteries. The K'NEX Saw Blade Thrill Ride can be purchased at Amazon for $59.99. I really like that the K'NEX sets can be combined together to make even more creations! The K'NEX sets really expand the minds of young and old builders everywhere! I highly recommend the K'NEX for your families. The Saw Blade Thrill Ride would make a great gift for those on your Christmas list. Today I was home with the kids. I usually babysit on Fridays, but it was an exception today. I brought Nathaniel to school this morning, because he was going on a field trip to the MN Science Museum! I was hoping to be picked as one of the chaperone's, but unfortunately my name wasn't one of the lucky draws. Hopefully I will make the next field trip. I really like going on those, because I can get to know his teacher and classmates better. That way, when he mentions someone from his class, I know who he is talking about. I wish that I was able to volunteer once a week, but that would require getting a sitter...not really realistic. I did some straightening up around the house today and did dishes. I will have extra company all weekend, so I have decided NOT to clean until Monday when my house isn't full of people. I really don't feel like cleaning it twice. Today, my father-in-law sliced wood for us, and that was greatly appreciated. It is a big job out there with the slicing and stacking. Our pile is huge and winter is coming...so, it is a must to get that done. We are hearing of possible snow on Sunday already. I am looking forward to the snow and winter. I am not a huge fan of the ice and freezing below wind chills, though. Tonight, Terry's mom and sister will be showing up for the weekend. It will be great to see them again! Tomorrow, Nathaniel will have a few friends over in the afternoon for his birthday party. That will be about 4-5 extra boys. I think Terry is going to be getting the boat and pontoon out of the lake, and finish winterizing the outdoors. We have a faucet that needs fixing before snow flies, too. In the evening, my parents will come over for dinner. We will be having a Grandparent supper celebration for Nathaniel...and to have a get together for them to visit. Like I had mentioned before, Terry's Dad is here from Alaska...and we haven't seen him in over 4 years. My parents have just met him on our wedding, so it will be good for them all to get to know each other. Sunday, we will be heading down to bring Terry's Dad back to the airport, and then I believe we will just relax the rest of the day. A Day of Rest. I think we will need a day of rest after the busy weekend. I will try to post some this weekend, but if I don't~ you know why. :) Have a super weekend everyone! Girls will be in girl haven with the new game from Briarpatch called Fancy Nancy Posh Bedroom board game! This game kids can enter Nancy's world where they can dazzle in her posh bedroom, play with the deck of tiaras, wands and bows. Her bedroom is frilly, socks are lacey, and she totes a pen with a plume. For ages 5+, “Posh is a fancy word for fancy!” 2 – 4 players will delight in helping Fancy Nancy transform her world from plain to fancy. She even teaches her family to be fancy. Boas, ribbons, tiaras and oodles of other frilly accessories make the posh makeover complete! This game is a challenge to see who the first player to complete the posh bedroom makeover is! You can purchase this game for $20.99 from Briarpatch. Briarpatch’s strong legacy of stimulating children’s lives through fun and eco-friendly products has earned the company over 300 industry awards (and counting). Since its founding, the company’s co founders applied environmentally conscious business practices in such innovative ways as using vegetable and soy-based inks and post consumer materials. A key ingredient to Briarpatch’s success has been to combine fun with learning. Both parents and children adore the exciting new licenses and products that Briarpatch continually brings to market. Few game and puzzle companies can boast a green thumb while enriching childhood. Would you like to enter to win your own Fancy Nancy Posh Bedroom Game? Briarpatch has offered to sponsor a giveaway for my readers! This contest is open to all readers living in the Continental United States. Go to the Briarpatch website, and look at all the games, puzzles and cards they have. Come back here and comment on which ones sound interesting, or that you would like to own. Click here to see how you can earn extra credits to win, and click here to see guidelines and the official rules. Contest will end on November 6th, at 7:00 PM CST. Just in time for the holidays, Lionsgate and HIT entertainment has come out with a 3-pack DVD collection of favorite Bob the Builder DVDs. The packaging also includes a collectible die-cast Scoop toy! In this collection, "Bob's Big Plan" shares the story about how Bob became a builder and learned which tools were right. This story tells about Bob's dream and his Can-Do Crew team! This is one of the best DVD's because it shares how Bob becomes partners with Wendy, meets Scoop, Muck, Dizzy, Lofty, and Roley. This DVD goes back to the beginning of Bob the Builder. Bob is so happy with his Can-Do Crew in "Bob's Top Team" as he assembles the best builders to construct a new school and visitor center. And in his largest project yet, "Bob's Big Plan," Bob is challenged to create a blueprint unlike anything seen before! Bob gets into big time building action building a new town from ground up! These are great DVD's for kids! Each DVD is 45 minutes or longer, and comes in a full screen format. 2008 HIT Entertainment and Keith Chapman owns the copyright. The Bob the Builder name and character, related characters and riveted logo are trademarks of HIT Entertainment Limited. You can find this great gift set at Amazon for $24.98 (on sale right now for $21.99). Winners of contests, news, and what's to come! Hello Everyone! I just want to say that I am so thankful for the companies that offer giveaways for my readers! I am so thankful for the readers that come and participate in the contests, too! Thank you everyone!! Yes, that is a candle in a slice of pizza! 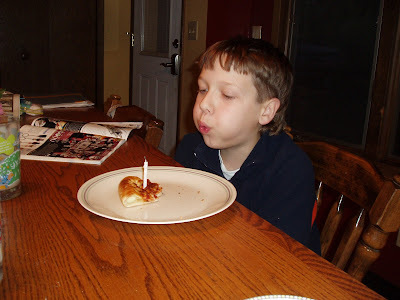 I cannot believe I have been a mom for 10 years now! Wow~ where does the time go? I was in so much pain 10 years ago right now as I type this! 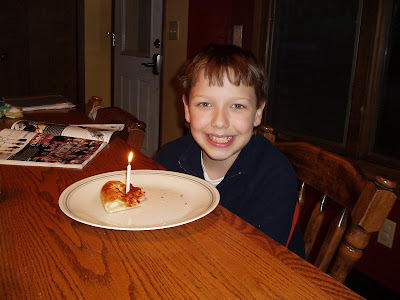 I will share my birth story of my oldest son: Nathaniel! After 45 minutes of pushing, out comes my beautiful, amazing, miracle baby boy! Weighing in at 8 pounds 6 ounces, and measuring 20 inches long. He was so small, and tiny and amazing! What a wonder God creates such amazing miracles! I was so overwhelmed...and TIRED. I loved holding him, cuddling him, and letting him sleep in my arms. I am so happy that God chose me to be his mom~ what an honor! I love you Nathaniel! You ARE my GIFT FROM GOD! Nathaniel means Gift from God. We will be celebrating a family meal out tomorrow night, and he is having a boys party on Saturday. Then, on Sunday we will have the grandparents over, and maybe some cousins. We had to postpone some of the celebrations off of his "official" birthday due to his birthday falling mid week. 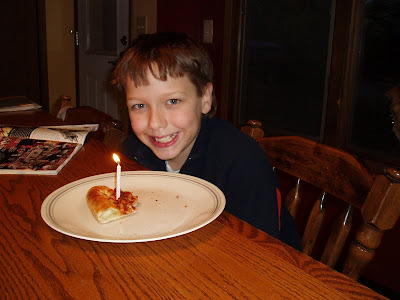 Happy Birthday to my first born...Nathaniel! Now he is in the double digits! Sensible Sippers: Review and 12 giveaways! contain no added sugar, artificial flavors or preservatives. Whenever I do give my kids juice, I always "water" it down so I can minimize the sugar intake. I really like the Sensible Sippers, because they are made with organic juice and water...no extra sugar! Sensible Sippers are available in 4 yummy flavors: Fruit Punch, Banana, Apple, and Mixed Berry. I have tried the Fruit Punch and the Apple (so far) and they are great! My kids really like them, too! They really like the pictures of the Berenstain Bear family! I think that these characters are great to put on kid's drinks. Sensible Sippers have 40% less calories than other brand juice boxes, as well. I recommend these juice boxes for your family! Sensible Sippers were created by R.W. Knudsen Family. Starting in 1961, Russel W. Knudsen began bottling fruit juices from his organic grape vineyard. He made his juices with fresh pressed and blended juices. He made a point to not have any artificial flavors, preservatives or sugar added to them. R.W. Knudsen Family products are still made from 100 percent natural ingredients without any added sugar, preservatives or artificial colors. **You can enter to win an 8-pack, just choose your flavor – apple, fruit punch, mixed berry or banana. This contest is only available in the US. **I also have 10 coupons for a buy one/get one free pack. There will be 12 winners in all! You can come and enter everyday for the duration of this contest. Please tell me what your first choice would be to win (juice pack or t-shirt). Click here to see how you can earn extra credits to win, and click here to see guidelines and the official rules. Contest will end on October 30TH, at 7:00 PM CST. Following her first book 'Let Them Eat Cake!' in the French Twist series, readers join Lexi Stuart in a crème de la crème adventure! Deciding to leave her familiar home in Seattle and her could-be boyfriend Dan, Lexi moves to a quaint village in France to pursue her dream of becoming a pastry chef. Life among the French initially proves to be less than easy as Lexi is challenged by her coworkers, missing her friends, and failing to master the perfect baguette. Determined to find her place, Lexi settles into the culture and life becomes la perfection. She finds a church, meets a new friend, and makes the acquaintance of a child named Celine—as well as Celine’s attractive, widowed father, Philippe. Even Patricia, the gruff pastry cook, shows a softer side as she mentors Lexi in the art of baking. Fast, fun, and packed with French culture, foodie appeal, and unique recipes readers will love accompanying Lexi on her journey in Bon Appetit as she tries to choose between two countries, two men and the faith to lean on God while savoring the surprises life brings! 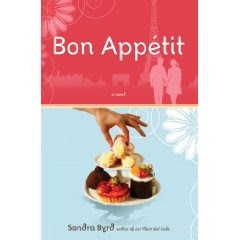 Author Bio: Best-selling author Sandra Byrd enjoys a successful career writing adult, teen, and children’s books, including the Friends for a Season, Secret Sisters series and the French Twist series, including the first Lexi Stuart novel, Let them Eat Cake. She is also a regular contributor to newspapers and magazines. Sandra lives in Washington state with her husband and two children. Sound like an interesting read? You can purchase this book at Amazon.com, or enter to win a copy by leaving a comment here letting me know what your favorite dessert is. There will be two winners, because I have two copies to give away! This contest is open to all readers living in the Continental United States. Click here to see how you can earn extra credits to win, and click here to see guidelines and the official rules. Contest will end on October 30TH, at 7:00 PM CST. Today, I picked Nathaniel up from school at 2:10. He had an appointment to get a baby tooth pulled. He wasn't excited about this at all. I told him they would probably numb his gums with a gel before they got started. He asked me if they were going to put a needle in his mouth. I couldn't lie, so I told him they probably will. I told him he probably wouldn't really feel it if they put that gel on his gums. The appointment went rather well. I did hear him cry out, and then shed a few tears. The Dental Hygienist came out and talked to me after the procedure. I didn't watch the time, but I really think it only took about 10-15 minutes total! I think that was good time! Anyway, she came out and told me he is a great kid, and that he did fine. She said that he told her he felt the tooth getting pulled out. She told me that when they put the needle in, he didn't feel it, so she wasn't so sure he did feel the tooth come out~ or if he just heard the crack sound. Either way, he did great, she said. He came out with gauze sticking out the side of his mouth. He was a little red eyed, but gave me a little smile. I told him he did great. After awhile, he was really liking that he couldn't feel his cheek or his lip. I told him that was the best part, unless your whole mouth is numb, and you end up biting your tongue and cheeks all the time. That is not so fun. I am glad his tooth is out. We will be looking at getting him into braces within the next year or so. I am NOT looking forward to that...especially the $$cost$$!! He has an overbite, teeth growing down out of the top sides of the gums, and his mouth is really crowded. Poor guy...hopefully the braces will be good for him. the Matchbox Mega Rig Shuttle Mission. This is a super toy, and great to expand your child's imagination! Caleb and Nathaniel have so much fun playing with this space shuttle extravaganza! I say that because this set create 30 different space combinations! My boys have a lot of fun with all the great accessories this Matchbox set comes with. There is a UFO space ship (that sounds a bit like the Jetsons and requires 3 AG13 button-cell batteries ~included) and has a seat in it for the green, rubbery space alien to sit to control the ship. There is also a space arm (which can grab things) that attaches to the inside of the doors on the top of the ship. Caleb likes to pick up other things with this arm, too. The Mega Rig Shuttle Mission building system starts as one gigantic space ship. I like that kids can use their creativity to make many creations! You can combine the Matchbox Mega Rig Shuttle Mission with other great Matchbox Mega Rig building systems, making it easy to combine different sets and sparking your child's creativity. 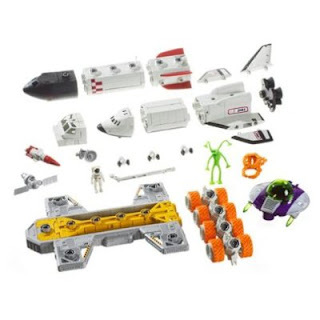 Also included in this set is an astronaut, wheels, ATV, a rocket, space shuttles, launcher, and more! This set is geared toward ages 4 and up (due to smaller parts). You can find the Mega Rig Shuttle Mission building system in retail stores, and online approximately $40-45. Seriously, my son Caleb really isn't interested in his other toys right now...this one is his first choice~ everyday! Another great toy suggestion is the Mickey Motors Raceway from Fisher-Price! This is a really fun race track geared toward ages 3 and up! There are two race cars included in the Mickey Motors Raceway~ Mickey Mouse and Pete. Other characters like Pluto and Goofy can be purchased separately. To start off the racing, you need to charge up the cars at the two Rev `n Go stations along side the track, and send them speeding. Once the race cars are charged up, kids will be delighted to hear the silly sound effects of Mickey's phrases, such as HoooooT Dog! among many other phrases. The sound effects requires the use of 3 AA batteries (and that is well worth it) with the giggles it creates. 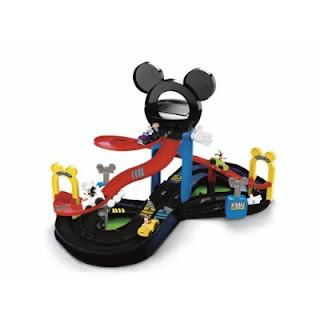 The Mickey hand elevator lets kids send the cars to the upper tracks for some high speed fun. When the race cars are heading out, Mickey's voice will count each time you pump, and when the voice reaches 10, it will tell you to "Go Racer One!" To launch the racer, you press down on the Mickey hand and off it goes. Kids will need to charge the racer after each lap to maintain speed, and Mickey will tell you what lap you're on. The elevator is a lot of fun! As racers ride into the tower, depending on whether the elevator is up or down, they will either pass through or stop in the elevator. When they stop in the elevator, kids will love raising the elevator using the Mickey hand, and then watching the racers race back down to the ground on the red track. If you are looking for a racetrack that the cars race side-by-side, this track doesn't do that. Instead, the racers start from different ends and the game keeps count of how many laps the racers have done to see who is winning. The Mickey Motors Raceway can be found at retailers and online for approximately $50-55. This is another great product to entertain your child for many hours! Saturday morning I went to my first stamp club for the new "stamp year." This is my third year in my Stampin' UP demonstrator's club. I really love going an making 2-3 card/scrapping projects. I like feeding my hobby by going and making some new creations. I really like getting new ideas! We have a requirement of a minimum $15 purchase to make each month...and trust me, it is NOT hard to meet that requirement~ in fact, I have a hard time keeping it near the $15 amount. There is so many stamp sets and accessories that I crave to add to my collection. There are 10 of us in her club, so each of us get one month where we are the hostess, get the hostess benefits (which is a big dollar amount of FREE merchandise), and bring the treats. It is a great time to get away for a few hours and craft with other ladies. The only bad thing is that my club time is at 9:00 AM~ and I am not a morning person...especially on a Saturday. It isn't so bad now, but it will be a struggle getting there that early once baby arrives in a couple of months! Terry's Dad, who lives in Alaska, is flying in for a week visit early Sunday morning. We haven't seen him since our wedding....just over 4 years ago. It will be good seeing him again, and getting to know him. I met him on our wedding day, and then we saw each other (I believe) 2 more times a week after our honeymoon. He has never met Caleb and Madelyn, so it will be great for them to meet and for him to get to know his grand kids. He is coming mostly because his sister passed away (early Saturday morning), so he is coming for the funeral and to see siblings. Some of the siblings he hasn't seen in over 10 years. I don't think that his family is real close with one another...I think it will be good to see and get to know my father-in-law, for the kids to meet their Grandpa, and for Terry to re-acquaint with his Dad. It has been great having MEA break. It was great to have Nathaniel home on Thursday. I really miss having the whole days with him at home. Gone are the days of homeschooling...where I saw WAY more of him, and knew what he was learning. I do miss those days sometimes, but I do know he is where he is thriving, and I believe God is honored with that decision. Nathaniel spent the night at a friend's house Thursday night, and then he went with Terry for the day to cut wood. I think that was great for them to spend time together. Terry got his last two loads of firewood on Friday. Now he is going to be splitting, stacking, and tarping the wood. I am so thankful that we are going to be able to heat our home with the wood stove again this year. We used it most of the winter 2 years ago, but then we had a house fire. (another story for another time). Anyway, today Terry finished up the remodel on the inside walls around the stove piping, so it is great. Saturday, I cleaned our basement, re-arranged the furniture, organized, de-cluttered, and cleaned off my work areas (a.k.a my desk and my craft table). I also swept, mopped, and cleaned up the upstairs living room/dining areas. It was a big-time work day (after my stamp club) but I feel wonderful that it is done...for now. I still have more to do, but it looks amazingly better. I wish I took before/after photos. It is work that has been staring me in the face for so long, and it is a relief having it accomplished. More things off my list of to-do's before my baby comes. ipod shuffle: site review & giveaway!! Ciao is a multi-million-strong online community that critically reviews and rates millions of products and services for the benefit of its members and users. Ciao even pays members to accurately review products in the consumer electronics, office equipment, home appliances, gaming and beauty categories and more. Ciao’s members and users can also browse from more than 2,000 of online retailers to find the most up-to-date and accurate pricing information on everything from laptops to video games to cell phones, movies, beauty products and more. Ciao began in Europe in 1999 and has become Europe’s leading shopping community and comparison shopping portal, offering more than five million consumer reviews and more than four million products in more than 25 product categories. Ciao has a presence in seven different companies and languages. A Beta version of Ciao.com launched in the U.S. in February 2008. Ciao.com USA’s headquarters are in San Francisco. Online Retailers for Ciao are: Amazon, HP, Buy.com, Chef’s Corner, COMP USA, Dell, Overstock.com, Preferredphoto.com, Sears, among hundreds of others… There are so many super products offered for purchase on Ciao, and one of them I am offering for a giveaway! I have an Apple ipod 1G Shuffle to giveaway to a very lucky Sassyfrazz reader! 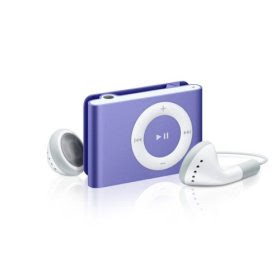 The Apple ipod 1G Shuffle holds 240 songs that you can wear on your sleeve or belt, and comes in 4 colors. This contest is open to all readers living in the Continental United States. Go check out the Ciao site and see all the reviews on the super products! Check out the colors of Apple ipod shuffles, and which color suits your fancy~come comment about it. Click here to see how you can earn extra credits to win, and click here to see guidelines and the official rules. Contest will end on October 30TH, at 7:00 PM CST. On Thursday, Maddie was walking around and then she said, "I poo...I poo!" So, I asked her if she pooped. She said, "Yes!" I went to go change her...and sure enough~ she did what she said she did! What a smart little girl! I really don't have a preference who will make the official leap into underwear, but it would be super if just ONE of them could make it to that amazing milestone before our little baby arrives! We got a sitter for us on Friday night. Terry asked me to find a sitter so we could go sing karaoke. One of the guys from his work runs a karaoke show in town once a month, so he wanted to check it out. So I did the calling around and booked *S* for the night. We brought Nathaniel to meet his dad, and on our way back home, Caleb was asking about who we had coming to babysit him. He said, "Mom, I want...um...what is her name again?" I said, "Who are you thinking of, Caleb?" (knowing who he was implying) He said, "Mr.P****'s daughter, what's her name?" (Caleb calls my friend, Lisa, Mr. P****, and I think it is so cute) Anyway, I told him, "Kaytlin?" And he said, "Yes, I really like Kaytlin. She is my favorite babysitter." We asked him why she is his favorite, and he said that she just is! And she is nice. Caleb: I wear diapers, *S*, do you wear underwear? *S*: (chuckling) Yes, Caleb, I wear underwear. Caleb: I am going to wear underwear someday, when I am potty trained, too. When I am a big boy. *S*: That will be a good thing, Caleb, you should start going on the toilet. Ha Ha Ha! I think that is so funny!! Dust, dander, and other allergy loomers...BE GONE! My husband and I suffer with so many different allergies. I am pretty much allergic to most things outdoors (hay, ragweed, pollen, etc.) and I am also allergic to dust, some dogs, and most cats (unfortunately). 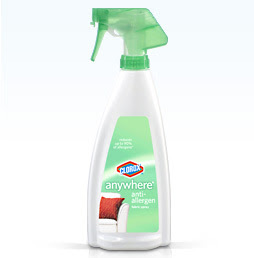 I was anxious to try the new Clorox anywhere anti-allergen fabric spray! MomCentral offered this sample for review, and I was excited to try it out since it would benefit our household! When I was cleaning today, I vacuumed the couches. After I vacuumed them, I sprayed them with the Clorox anywhere anti-allergen fabric spray. There isn't any scent to the spray, but it does seem fresh! Our dog jumped up on the couch after about 20 minutes, sniffed around, and sat down. She didn't seem bothered by it, either. I really like that this Clorox anti-allergen spray is gentle enough to use around kids and pets, is safe on most fabrics (see label), and is fragrance/dye free while neutralizing up to 90% of allergens (including dust mite matter, dog and cat dander). I have only tried this on my couch cushions, but I know that we will use this on our mattresses, and carpets. Clorox Anywhere Anti-Allergen Fabric Spray is made from pure water and refined sodium hypochlorite. Clorox Anywhere Anti-Allergen Fabric Spray is a pH-balanced formula of pure water and refined sodium hypochlorite that helps neutralize allergen proteins, changing their structures to render them inactive. Neutralized or denatured allergen proteins are not recognized by your body, reducing their ability to trigger allergic reactions. I think this is a super product, and will be a much-used product in our home. Shape of Mercy: Book Review and Giveaway! Women of all ages will appreciate this highly-readable, layered, and fast-paced story about self-discovery at all stages of life. With rich undertones of intrigue and romance, this contemporary novel with a historical twist explores personal blinders and how upbringing and conditioning can shape people to judge others in ways that can lead to unhappy consequences. I am currently reading The Shape of Mercy, and I have a hard time putting it down! Author Bio: From early school-day projects to becoming editor of a local newspaper in Minnesota, Susan Meissner’s love for writing has been apparent her entire life. The Shape of Mercy is her latest novel in a string of books that delve into the deeper issues of life. She is the author of nine novels and lives with her family in San Diego. Find out more about her at http://www.susanmeissner.com/. Would you like to win a copy of this great book? I have two copies to give away! This contest is open to all readers living in the Continental United States. Just leave a comment that you would like to win! Click here to see how you can earn extra credits to win, and click here to see guidelines and the official rules. Contest will end on October 30TH, at 7:00 PM CST. You Can Make This: Website review and Giveaway! I was super excited to be introduced to this great new site called YouCanMakeThis.com! YouCanMakeThis is a super website where Moms can find several projects they can make and create on their own. YouCanMakeThis sells several eBooks for reference with making these projects! YouCanMakeThis.Com is an innovative website that provides mothers and other family members with instant access to patterns, eBooks, instructions, and tutorials for a myriad of favorite craft and sewing projects. Customers can learn to make twirl skirts, hair bows, and other unique boutique clothing. The company gets the instructions for the projects by finding mothers who want to share their expertise in a variety of areas including sewing, appliqué, woodworking, crafts and more. 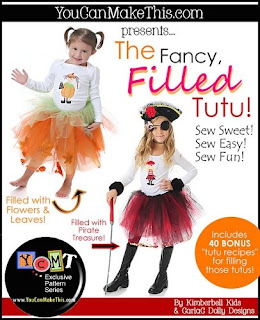 I was able to get the eBook for how to make Filled Tutus! YouCanMakeThis downloadable eBooks provide simple, step-by-step guides for quilting, knitting, aprons, crochet, scrap booking and sewing. For those unfamiliar with eBooks, basically, they are files that can easily be downloaded, saved and then printed or read on a computer monitor. The website offers more than 700 projects that help moms make things for their children, for themselves and even teaches tweens how to learn a new skill. What a great site for learning how to keep funds in your pocket with your own creations! I know when I was little, my mom made me several things from hand. I treasure those home-made gifts! Most eBooks are $9.95 or less, and dozens of popular projects are bundled with several patterns and styles such as Boutique Dress Top and Bottoms for $15.95. There are also many free projects that can be found while surfing around their website. YouCanMakeThis.com has a great selection of categories to choose from: baby products, boys, crafts, clothing, scrap booking, doll clothing, quilting, jewelry & beading, shoes, toys and more! I think this is a great website full of knowledge from Moms all over! You can purchase your own eBooks that spark your interest, or enter for a chance to win! This contest is open to all readers living in the Continental United States. Go to the YouCanMakeThis website and take a look at all the different projects. Comment on which one you would be most interested in learning about. You can see all the different categories on the left hand side of their site. Click here to see how you can earn extra credits to win, and click here to see guidelines and the official rules. Contest will end on October 30TH, at 7:00 PM CST. Celebrating Moms with Generation Huggies: with a video contest! Generation Huggies is celebrating 30 years! In Honor of Huggies' 30th Anniversary, 30 Real Moms will be Featured in a live National Online Ad Campaign. The Huggies brand recognizes that every mom is unique. To celebrate 30 years of moms who have inspired them, today the Generation Huggies Program embarks on a cross-country tour to learn what it means to be a mom. This Sweepstakes is to enter for a chance to win $30,000 to support the next generation of Huggies babies in the Generation Huggies Sweepstakes. The stories of 30 moms from across the country will be featured in a national online ad campaign in early 2009. To officially launch the Generation Huggies Program, the Huggies brand has partnered with celebrity mom Alison Sweeney of "The Biggest Loser" and"Days of Our Lives." Alison, who is both a mother and an expectant mom, knows the ups, downs and in-betweens of motherhood. She will be in New York City to welcome local moms to the Generations Huggies Program and share her thoughts on motherhood. In honor of the brand's 30th anniversary, one lucky winner will receive $30,000! From October 3, 2008 through November 30, 2008 everyone can enter to win the grand prize by entering online at Generations Huggies.com. The winner will be chosen in a random drawing from among all eligible entries in December 2008. Visit Generation Huggies for the official sweepstakes rules and details. Entry is limited to one per day per person or e-mail address during the Sweepstakes Period. Void where prohibited; no payment or purchase necessary. The sweepstakes is open to legal residents of the 50 United States plus the District of Columbia, age 18 or older. 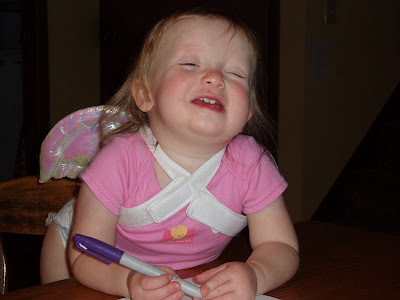 The Huggies brand provides customized products for babies’ changing needs. Huggies brand diapers provide customized comfort for all babies. A portfolio of baby toiletries products are offered from the Huggies brand and include: bath wash, lotion, shampoo and disposable washcloths. There is also a Huggies brand baby wipe that is just right for every baby: Extra sensitive, wipes with Shea Butter, Lavender & Chamomile, Nourishing, Natural Care and Supreme wipes. For all moms needs, wipes are available in Pop-Up tubs, refill packages and convenient travel packs. Huggies Little Swimmers disposable swim pants make water big fun and are available in 3 colors and 3 sizes. Kimberly-Clark (NYSE: KMB) is a leading global health and hygiene company with operations in 37 countries and product sales in more than 150. Kimberly-Clark and its well-known global brands are an indispensable part of life for people in more than 150 countries. Every day, 1.3 billion people – nearly a quarter of the world's population -- trust K-C's brands and the solutions they provide to enhance their health, hygiene and well-being. With brands such as Kleenex, Scott, Huggies, Pull-Ups, Kotex and Depend, Kimberly-Clark holds the No. 1 or No. 2 share position in more than 80 countries. To keep up with the latest K-C news and to learn more about the company's 136-year history of innovation, visit www.kimberly-clark.com. I love coming across super products for my kids to enjoy hours of fun playing with! I received the Holgate Baby Blocks to review and I can say that they are made with amazing quality! The blocks are a bit bigger (than ones I grew up with) measuring 1-3/4". I am really impressed with how these blocks were designed. The blocks have great, colorful graphics on each of the six sides. I can easily introduce colors, shapes, and letters to my kids with the Holgate Baby Blocks! Each Holgate Baby Block set includes 6 blocks. The blocks are made with Hard Maple and the corners of the blocks are rounded. The finish on the blocks are coated with a Non toxic finish. I really think it is super that the Holgate Baby Blocks are made in the USA by Holgate Toys! Holgate Toys are America's Finest Wooden Toys since 1789! Holgate Toys were featured at the 1939 World's Fair in New York. The designer of the first Holgate toys were by Jarvis Rockwell, who is the brother of illustrator Norman Rockwell. Retail price for a set of 6 Holgate Baby Blocks is $16.99, which is a great price for the value you receive! These blocks are recommended for ages one and up. Holgate Baby Blocks are one of the many great (American made) toys carried by NMCtoys! 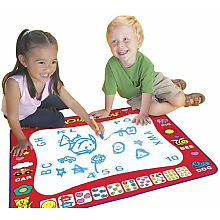 NMCtoys.com was developed by parents of two small children in 2007, with the mission to provide quality toys that stimulate and challenge a child's mind. They were very frustrated with all the toys that were made in China being recalled. The good, quality toys that we grew up with no longer existed. NONE of the toys found in NMCtoys.com are Made in China. People can rest assured that they will get quality, and safe toys when they purchase from NMCtoys! NMCtoys.com typically deals with smaller manufacturers and posts the country of origin for all toys. NMCtoys.com pledges that, "our toys will last....even if they don't have lights or make sounds." Many of their toys have received awards and meet or exceed USA safety standards. Some of our toys offer a lifetime guarantee from the manufacturer. NMCtoys.com is not the manufacturer of toys. We are a retailer of quality European and American Toys. I love our Holgate Baby Blocks! I highly recommend these to all families! Clean Fun with Spin Master's Products! My kids love playing with water. Most kids love playing with water! Bath time is a great time for our kids to just play in the water with their toys! They also love playing with bubbles! I am a happy Team Mom member and I received two (very fun and inventive) products from Spin Master to review! I love finding out and trying new products for our kids! I love helping spread the information on to you, my readers! The first product I am going to show you is the Kid Kleen Bath Blizzard. What a fun, FUN product to spark an array of smiles on your children~ it sure did with Caleb and Madelyn! 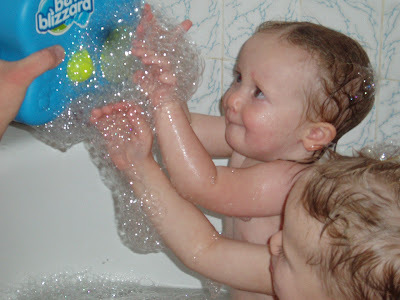 The Kid Kleen Bath Blizzard makes a TON of bubbles, and they feel so light and soft. I really like how the bubbles don't make the water soapy. The bubbles do last quite awhile. 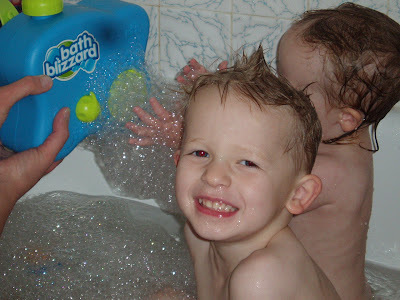 Caleb and Madelyn just giggled with glee over the volcano of bubbles erupting from the Bath Blizzard! The only thing I would like to see differently with this product, is it leaks from the bottom. It is best to leave it in your tub to drip out, or pour the remaining water/soap out when you are finished. Kid Kleen products are safe and non-toxic, wheat and tears-free~ PLUS hypo-allergenic. That is a big plus for our family, since my kids are super sensitive to certain soaps. The Kid Kleen Bath Blizzard operates on battery power, and just a turn of the knob creates a waterfall of bubbles. There is a handy strap that you can use to attach the Bath Blizzard to the faucet or towel rack. The retail price for the Bath Blizzard is $19.99 and comes with a bottle of bubble bath soap. I think for $19.99, you get hours of sheer fun in the tub for your kids! You can purchase this fun toy at Target, Walmart or ToysRUs. Ju-Ju Be BeLight: Review and Giveaway! Potty Adventure DVD: A Review and a Giveaway!